Hello Trail Travelers! Below are the tentative dates and times for the Heritage Trail 2019. Once these are finalized, we'll post the 2019 Trail Guide on this blog! We are still setting the dates for this year's Heritage Trail but we wanted to share some other key dates with all of you. This year is the 150th anniversary of the Transcontinental Railroad and to commemorate this significant milestone, many of the museums and historical societies we work with have scheduled some key events that you might be interested in attending. The events run from April through September and are listed below. As more information becomes available, this list will be edited and modified, so please keep checking back! April 23, Union Pacific will park a special rail car where Atlantic and Vernon Street meet in Historic Roseville. The railcar will house beautiful photographs, interactive displays and other pertinent information regarding the Transcontinental Railroad and its significance. Event is open to the public and free – 9:00am – 3:00pm. Saturday, May 4: Roseville Historical Society at the Carnegie Museum. Festivities center around the unveiling of “The Rail of Two Cities” display by the Roseville Roundhouse Model Railroad Club. The display depicts the 1869 Transcontinental line going through Roseville and Rocklin – 10:00am to 3:00pm. May 10 – Labor Day Donner Summit – Truckee Transcontinental Railroad Sesquicentennial Celebration. May 10 Noon Ribbon Cutting Kickoff at Truckee Train Depot. 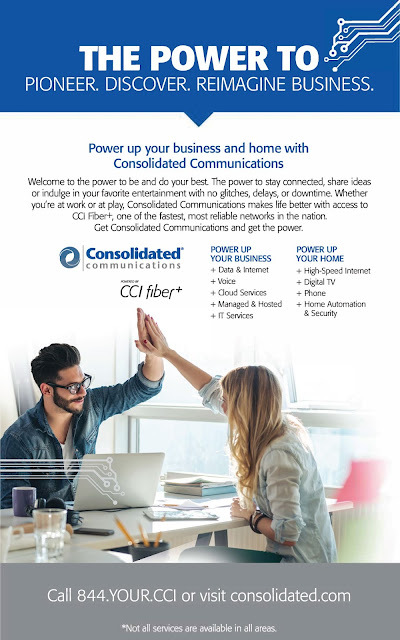 Reception – 12:00pm. Saturday, May 11: Dedication of the Transcontinental Railroad Plaque will occur at the old Railroad Depot in Rocklin by the Rocklin Historical Society. Rocklin History Museum Tour will include the display “The Rail of Two Cities” which depicts the 1869 Transcontinental line going through Roseville and Rocklin – 11:00am. May 11, History Talk: The Meaning of the Railroad. Presented by Jerry Blackwill of the Truckee Donner Railroad Society at the Truckee Tahoe Airport Conference Room – 7:00pm – 8:00pm. Saturday, May 18: 150th Anniversary of the Transcontinental Railroad. Presented by Phil Sexton of the California State Parks at the Gold Rush Museum (601 Lincoln Way in Auburn) - 1:00pm - 2:30pm. May 18, History Talk, Sierra Speaker Series. Norm Sayler will speak about the history of Old Highway 40 and the Impact on this area at Donner State Park – 5:30pm. May 20th, Plaque Dedication: George Wyman, First Motorcycle Rider over Donner Summit and going Cross Country. The George A. Wyman Memorial Project (website) at the downtown Visitor's Center in Truckee. There will be a commemorative motorcycle ride from the site of the old Summit Hotel (across from Donner Ski Ranch) to the Visitors Welcome Center at the Old Train Depot in Truckee. Any/All riders are invited to participate. Dedication starts at noon. June 1, Historical Talk: “The Firsts”. Presented by Bill Oudegeest of the Donner Summit Historical Society at the Truckee Tahoe Airport Conference Room. This presentation will be regarding the Major events that were the “First” to occur over Donner Summit. This will include information about the motorcycle, bicycle and automobile – 7:00pm. June 8, History talk: The Story of Tunnel 6. Presented by Bill Oudegeest of the Donner Summit Historical Society at the Clair Tappan Lodge. This presentation will the story of Tunnel Six, otherwise known as the Chinese Tunnel. This is the primary tunnel on Donner Summit and was dug by hand using Chinese Workers. NOTE: A BBQ will follow hosted by Clair Tappan Lodge, Ticket information for the dinner and RSVP to follow soon – 5:00pm. June 10: Locomotive Technologies. Presented by Jerry Blackwill at Pizza on the Hill, hosted by Mountain Minds Mondays. 6:00pm is Pizza ($5.00) then the talk at 6:45pm. June 15th, Interpretive walk: Boca Townsite. Presented by Nelson Van Gundy of the Truckee Donner Railroad Society. The talk will revolve around the historical data not only on the town but the Ice Industry and the Railroad both Standard Gauge and Narrow Gauge from the Logging Industry. Time: 10:00am. June 15th, Historical Talk: Boca Brewery and Steam and Beer. Venue: Donner State Park Visitors Center. Speaker, Dave Burkhart, Anchor Steam Company. Dave will be speaking on the history of the Boca Brewery and how that history and product plays into a currently sold product created by Anchor Steam Company. (Video) - 5:30pm. June 22nd, Historical Talk: The Chinese and their importance to the Railroad. Presented by Bill George at the Donner State Memorial Park Visitors Center - 5:00 pm. June 29th, Historical Talk: Snow Sheds-Fires and other Related Subjects at the Tahoe Truckee Airport Conference Room. 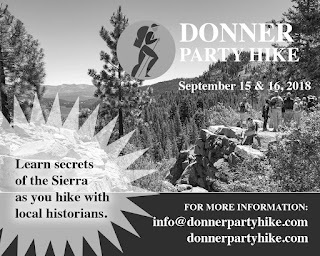 Presented by Bill Oudegeest of the Donner Summit Historical Society - 7-8pm. July 4th, Annual 4th of July Parade from Truckee High School to Church Street in Truckee. Parade starts at the High School/Elementary School area at 10:00 am. The theme this year will be the 150th Anniversary of the Transcontinental Railroad and Railroad. July 13th, Truckee Tahoe Airshow at the Truckee Tahoe Airport. Come see us on the Tarmac – 9:00am – 3:00pm. July 13th, Historical Talk: Ice Industry in the Truckee Area. Presented by Bill Oudegeest and Chaun Mortier at the Truckee Tahoe Airport Conference Room - 7:00 pm. July 18th, Historical Talk: Jerry Blackwill will present the History of the Construction of the Railroad at a Pay Dinner for the Tahoe Donner Giving Fund, Northwoods Lodge. - 5:30pm. July 20, Historical Talk: Lincoln Highway. Presented by the Lincoln Highway Association at the Donner State Park Community Room. Discussion of the progression of transportation from the Railroad to the Lincoln Highway – 5:30pm. July 27th, Historical Talk: Logging Railroads. Presented by Nelson Van Gundy at the Truckee Tahoe Airport Conference Room. A discussion on how the logging industry was tied to the development of the Railroad and the surrounding areas – 7:00pm. July 28th. Trestle Tour Drive/Walk. Sponsored by Truckee Donner Railroad Society. This event will involve driving from Downtown Truckee to Various Locations to view old Logging Trestles and educational Talks regarding the logging Industry between Hobarts Mills to Boca. Bring a lunch and Carpooling is available. Time to be announced. We will meet at the Railroad Society Museum Caboose in Truckee at 9:00am. August 3rd, Historical Talk: Truckee Lake Tahoe Railway presented by Jerry Blackwill at the Truckee Tahoe Airport Conference Room. Discussion regarding the History of the Truckee Lake Tahoe Railway and the impact of creating tourism for the Lake Tahoe Basin – 7:00pm. August 15th, Celebration: 150th Anniversary of the Assumption Catholic Church. Non-GSC, informational only. Truckee Community Arts Center, Church Street. August 17th, Historical Talk: Vigilantism in American and its Effect in Truckee by Mark McLaughlin at the Donner State Park, Community Room – 5:30pm. August 24th, Historical Talk: Henness Pass/Independence Lake and its connection with the Big 4 and the Development of the Resort Concept. Presented by Corri Jimenez, Architectural Historian and Historic Preservation Constractor, in the Truckee Tahoe Airport Conference Room. What is the connection to railroad? Guess you will have to come to find out! 7:00pm. August 31: Our final goodbye to the Celebration of the Transcontinental Railroad will be held at the Regional Park Railroad Terminus in the Truckee River Regional Park. Plans are still being finalized but the vision is a wonderful day at the park riding the trains, eating lunch, kids playing and lots of history discussions! There will be CAKE and BBQ Truckee Style - 11:00am - 3:00pm. Keep checking back -- more information to come! Heritage Trail 2018 has come to a close. We thank everyone who took the time to hop on the Trail, whether you only made it to one of our museums or if you visited all 22. Once we have gathered all of the Get-Up-And-Go cards and Student Scavenger Hunts from all the participating museums, we'll draw the winners (probably the week of the 17th). We hope you all had a great time and we look forward to seeing you again next year! Our next post will be of the Basket and Scavenger Hunt drawing winners! View exhibits on the history of the DeWitt Government Center from its inception as a World War II Army Hospital, its use as a State Mental Hospital and finally its use as a Placer County Government Center. 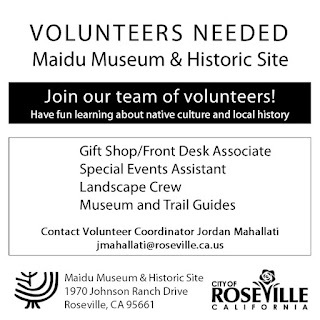 Displays will also cover the early history of the area from Nisenan Maidu Indians to early mining and ranching. Special van tours of the historic campus every half hour from 4:00 pm to 5:30 pm. Normal Hours of Operation: Wednesdays Noon – 4:00 pm. Watch blacksmiths craft period tools, view exhibits on mining, Native American Heritage, the lumber industry, fires & firefighting and life in the Victorian era. Hands-on activities for kids, craft and food booths, gold panning demonstrations, and visitors can watch the State Gold Panning championships. Visitors can also enjoy the re-enactments of the Georgetown Regulators. They are combining the Heritage Trail with their annual Heritage Festival. For the full Heritage Trail calendar and for information on the Student Scavenger Hunt, please scroll to the post below. 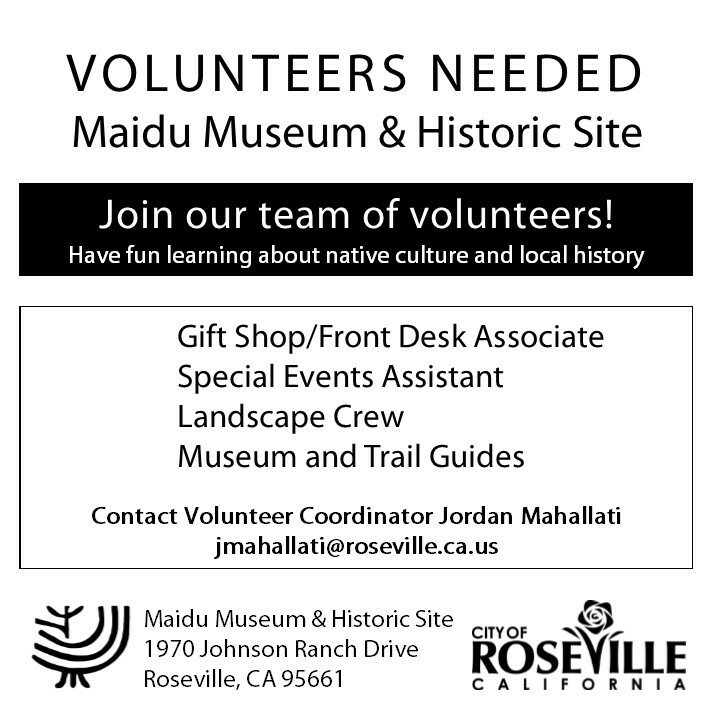 22 MUSEUMS - ROSEVILLE TO TAHOE! We are glad you decided to join us on the 2018 Heritage Trail Museums Tour. This is the 11th year for the event and 22 museums from Roseville to Tahoe are opening their doors free of charge for certain days throughout the summer. All 22 museums are committed to showcasing history in a fun and entertaining way. For many Trail Travelers, this event has become a family tradition. This year, just as last year, geographic clusters of museums will have their Heritage Trail event on certain Saturdays throughout the summer. This way you have the whole summer to visit participating museums. If you are a student entering K thru 12th grade, you can enter a chance to win a Samsung Galaxy tablet, a Kindle Fire or backpacks full of school supplies by completing a student scavenger hunt. Scavenger hunts are available in participating museums or online. Here are links to the three different versions: The Valley Museums, The Foothills Museums, and The Mountain Museums. Parents may help younger students fill in their scavenger hunts. For questions about The Heritage Trail, please call 530-889-6500. Eating, drinking and smoking are not permitted in the museums. You’ll want to bring your camera. Inquire at each museum for flash photography guidelines. Be sure to pick up your FREE Get Up & Go card at the first museum you visit. If you can’t make it to a museum on their Heritage Trail Day, please visit them during regular hours of operation. This year it will take 8 stamps on your Get-Up-And-Go card to qualify for a gift basket drawing. Dive into family-friendly living history fun! Explore vintage toys and wagons. Make a mini fruit crate and rag dolls. Challenge your knuckles—do laundry the old-fashioned way. Dress up in 19th century style and take advantage of multiple photo opportunities. And be sure to refresh your family with watermelon and hand-cranked ice cream! Auburn Grammar School, built in 1915 (now Auburn City Hall), listed on the National Register of Historic Places. Get a rare sense of old school days in a classroom packed with photos, scrapbooks, maps and old school books. Try your hand at string games and penmanship. Young visitors will be engaged with 1916 classroom activities. Enter the free “just for kids” basket drawing. Ample parking behind building. School songs of yesteryear with Clifford Johnson at 1:00 pm! Pan for gold in our indoor panning stream, tour museum which includes a replica mining tunnel, gold rush era artifacts and play an interactive Gold Rush game. 11:00 am plaque dedication to May Perry, first Placer County Museum Curator. View exhibits on granite quarrying, the Penryn Granite Works business, the history of Penryn and the Griffith Family. Hands-on exhibits and a guided tour of the Quarry Park at 8:30 am. View exhibits on Rocklin pioneers, buildings and granite quarrying plus extensive photographs and interpretation of J.P. Whitney and his land holdings. Granite splitting demonstration at 11:00 am – you can’t miss this! View the Marion Steinbach Indian Basket Collection and exhibits on Tahoe history; special exhibit on the 1960 Winter Olympics; and special activity outside. Enjoy exhibits on contemporary nature in our region as well as fossils of life that lived millions of years ago. Special program on sharks during their Heritage Trail! Normal Hours of Operation: Open when school is in session; first Saturday of the month 10:00 am - Noon. Overview of Placer County history, Pate Collection of American Indian Artifacts, gold collection, restored Sheriff’s Office, Women’s Jail with Alma Bell, Placer County authors table and the Placer County Genealogical Society will offer guidance on family history research. Normal Hours of Operation: Saturdays 11:00-3:00, April-October. View Nisenan artifacts, Gladding McBean & Co. photographs, a gold scale from the Van Trent Mine, military uniforms and artifacts and Chinese baskets. Also on display are a restored buggy and a grain scale from the local Walter Jansen & Son. Miss Katy will be showing off her fabulous late 1800s kitchen and come see the Lincoln Depot replica – it’s wonderful!. Beverages and cookies available. Normal Hours of Operation: Tuesday through Saturday 11:00-3:00. Experience exhibits on the history of the railroad, gold mining, pioneer life, as well as collections of Maidu Indian and Chinese artifacts. Drinks and snacks will be available. Enter a drawing for books on Donner Pass and Railroads of Placer County by local authors Roger Stabb and Jack Duncan. Visit the best preserved Gold Rush town in Placer County. View exhibits on nearby towns, hydraulic mining, the railroad, the Towle Lumber Company, the Maidu Indians, and the Chinese. Guided walking tour of Dutch Flat at 10:00am followed by Cemetery Tour at 11:30am. In celebration of the Lincoln Highway and Highway 40 there will be a handout available with a map and list of local points of interest where the routes run through this area. Donner Summit is the richest historical area in California: first wagon trains, first transcontinental railroad, highway, telephone line, and air route. Lincoln Highway and Historic Highway 40 talk by Norm Saylor at 1:30 pm. The Roseville Historical Society's Carnegie Museum and Archives is filled with artifacts and ephemera of Roseville's past! We highlight our train display, a massive "N" gauge model railroad depicting Roseville's Old Town and peeks into our turn-of-the-century past. We also feature the pioneer Roseville Fiddyment family, beginning with matriarch Elizabeth Jane and the next several generations who worked the land and used its resources to make a living. The feature display this year is “A Walk Through Time on Vernon Street” which traces the history of Roseville evolving from a railroad town to the exciting, bustling city it is today! Normal Hours of Operation: Tuesday thru Friday 12:00- 4:00; 1st Saturdays 10:00-2:00. On this, our seventh year, we're going to tour mostly on the north side of Old Highway 40, Donner Pass Rd. Of course the walk will be illustrated with dozens of historic photographs and lots of stories. This year will be very ambitious for the number of stories to tell. We’ll be starting at the Donner Ski Ranch parking lot and talking about Tunnel 6, the Summit Hotel and the railroad facilities right there. Then we’ll cross Donner Pass Rd. and talk about Sierra Junipers, the transcontinental air route (and the remains of the weather station buildings where there is a GREAT view), the Catfish Pond or Maiden’s Retreat (above), the idea that the north side of Old 40 was the Emigrant Trail and possible proof, the recent report of cadaver dogs and Donner Party, down and around to Old 40, Donner Pass Rd. and across to the petroglyphs, China Wall, up the old Lincoln Highway to the PCT trailhead, and back to the start. Do not consider going on this hike unless you are nimble because there are parts where we’ll have to scramble over some rocks since there is no trail. Meet at 9:30 am each day at the Donner Ski Ranch parking lot (19320 Donner Pass Road) and bring a hat, good shoes, sunscreen, water, camera, lunch, and curiosity. Sept. 15th Community Education program: “Beyond a Miracle, Creating California’s Empire of Agriculture” Film presented by Bill George at the Bernhard Museum Winery at 1:00 pm. You can pick-up your Get-Up-And-Go cards at the first Heritage Trail Day (June 16th) from the Bernhard Museum, Benton Welty School Room or the Gold Rush Museum. After that day, you can pick up Get-Up-And-Go cards from any participating museum. You can pick up cards and get them stamped on any day the museum is open throughout the summer. This year, it will take 8 stamps on your card to enter the drawing for a gift basket. Please remember that you can only play one Get-Up-And-Go card at a time. You are free to start another card once you have turned in a fully stamped card.